With the increasing need for efficient management of medical imagery and associated information and data, the global market for medical imaging information systems is observing a tremendous upswing in its size and valuation. The usefulness of medical imaging information systems in tracking billing information and radiology imaging orders is supporting the uptake rate of these systems across the world, leading to a high growth of this market. Going forward, the increasing usage of these systems in billing, record-keeping, and managing image archives in association with vendor neutral archive (VNAs) and PACS is likely to boost this market substantially in the years to come. Nowadays, the amount of data and information in the healthcare sector is piling up significantly, leading to a number of complexities. This, as a result, has paved the path for the emergence of new information systems in the medical and healthcare infrastructure in order to streamline the workflow and improve the quality of services. All these factors are expected to propel the demand for medical imaging information systems across the world in the near future. However, the market may witness hindrances in the coming years due to the lack of skilled professionals. Nevertheless, continual update and innovation in products, triggered by tremendous growth from modalities, are likely to create lucrative opportunities for the further growth of this market, whose opportunity is anticipated to touch US$772.4 mn by 2017. Researchers estimate the market’s opportunity to further increase at a CAGR of 5.20% between 2017 and 2022 and reach a value of US$993.6 mn by the end of the 2022. The global market for medical imaging information systems is broadly evaluated on the basis of the modality, type of software, and the end user. Based on the modality, the market is classified into computed tomography, positron emission tomography, magnetic resonance imaging, X-ray, ultrasound, and mammography. Among these, computed tomography is leading the market, at present, and is expected to remain so over the next few years. Based on the type of software, the market is categorized into PACS system management, radiology information systems, and integrated software solutions. With the data in the medical and healthcare industry mounting substantially, the demand for these software is likely to increase in the near future. Hospitals, diagnostic imaging centers, and ambulatory surgical centers (ASCs) have surfaced as the key end users of medical imaging information systems across the world. The worldwide market for medical imaging is also assessed on the basis of its geographical presence. North America, the Middle East and Africa, Europe, Asia Pacific excluding Japan, Latin America, and Japan are considered as the main regional markets for medical imaging information systems across the world. Of these, North America has been leading the global market and is anticipated to continue doing so over the forthcoming years, thanks to the presence of an advanced medical and health care infrastructure and a sufficient number of skilled professionals. This regional market is expected to report a CAGR of 5.50% between 2017 and 2022. Varian Medical Systems, Mindray Medical International Ltd., Hitachi Medical Corp., Toshiba Corp., Fujifilm Corp., Siemens Healthcare, Koninklijke Philips N.V., Neusoft Medical Systems Ltd., Hologic Inc., GE Healthcare, and Esaote S.P.A. are the leading vendors of medical imaging information systems across the world. The significant rise in the need for efficient management of medical imagery and associated information and data has fueled the demand for medical imaging information systems across the world. This research report presents a detailed assessment and forecast of this market, underlining its performance in various regions. It further provides the historical data of regarding this market while forecasting its status during the period of 2017 to 2022. The driving and restraining factors of this market, coupled with, their impact on the demand for these systems during the forecast period is discussed here with high importance. A thorough study of the opportunities available in this market on the global as well as the regional level has also been included in the market report. In an effort to offer the readers of this research report with a comprehensive overview of this market, researchers have included an in-depth competitiveness analysis and information about the unique selling propositions of the leading players. Further, the report includes analyses of the market’s attractiveness and basis point share on the basis of the end-use, type, and power class of medical imaging information systems. 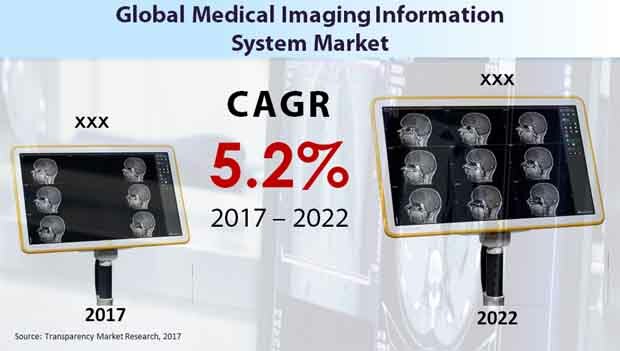 The market numbers have also been estimated in this study on the basis of the average usage of medical imaging information systems in various application areas. The market size and predictions for each of the segment have been offered in the context of the global and domestic markets. The dynamics of medical imaging information systems market Japan, Asia Pacific excluding japan, North America, Europe, and the Middle East and Africa have been taken into consideration for the estimation of the future growth of this market. The market has also been assessed on the basis of expected demand. The revenue generated from medical imaging information systems across the world have been derived using the regional pricing trends. The market data for each segment is based on the demand and the corresponding revenue. Broadly, the global market for medical imaging information systems is evaluated in the basis of the type of the software, end user, modality, and the regional presence of this market. Based on the type of the software, the market is bifurcated into PACS system management, radiology information systems, and integrated software solutions. By end user, the market is categorized into the Hospitals, diagnostic imaging centers, and ambulatory surgical centers (ASCs). On the basis of the modality, the market is classified into computed tomography, positron emission tomography, magnetic resonance imaging, X-ray, ultrasound, and mammography. Geographically, the market is divided into North America, Asia Pacific excluding Japan (APEJ), the Middle East and Africa (MEA), Europe, Latin America, and Japan. The segmentation consist of the demand for medical imaging information systems in all the regions as well as their significant economies. The patterns of the demand for these systems in each of the regions have been determined while estimating the market for various application for medical imaging information systems in them. The segmentation of this market by the end user, modality, and the type of the software has been derived through the bottom-up approach, which is accumulative of the demand from each of the regions. The regional demand for medical imaging information systems is the summation of the prominent sub-regions and the economies within a specified region. Varian Medical Systems, Mindray Medical International Ltd., Hitachi Medical Corp., Toshiba Corp., Fujifilm Corp., Siemens Healthcare, Koninklijke Philips N.V., Neusoft Medical Systems Ltd., Hologic Inc., GE Healthcare, and Esaote S.P.A. are some of the prominent companies in the global medical imaging information systems market.